Online gaming is hugely popular around the world. It’s no surprise that China tops out on the international gaming chart put together by newzoo.com. Of the approximately 1,383,837,000 people in the country, over 789 million of them have an online presence. This brings in a gaming revenue of over $24 billion dollars a year. For a significantly smaller population, the United States isn’t far behind in revenue. There may only be about 324 million people in the U.S., but of that population, over 293 million are online. The ones playing games bring in only $825 thousand less dollars than the entire population of China. There is no doubt that gaming is a huge revenue stream for many countries around the world. People obviously love to play…but one can wonder, do gamers ever tire of spending the whole of their lives dialed into a gaming service instead of being dialed into the hotline to love? For internet wizards, it makes sense that if they live by the computer, they love by the computer. Dating can be made easy for everyone online, but for people who spend all of their time hooked up to screen, dating is that much easier. You might lose the game, but if you win at love, that makes up for it, right? With all of the tech devices people have now days, it shouldn’t be too hard to swipe right while you’re simultaneously engrossed in an alternate universe slaying dragons, right? Luckily for gamers, it’s become such a presence in the culture, that it’s not hard to find other people with the same interests. Gamers who are looking for love want to find somebody they can relate to. 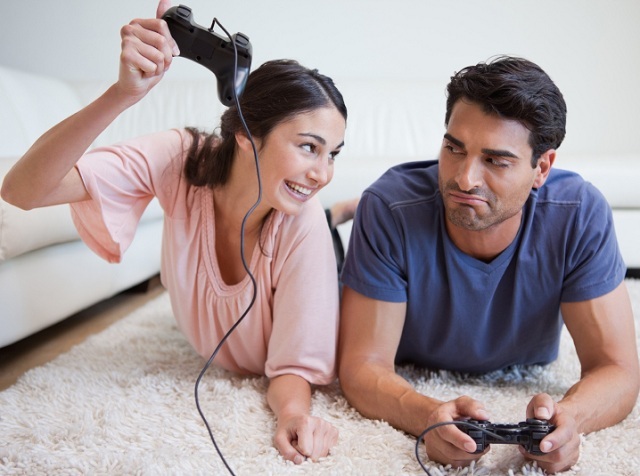 While they can go on gaming dating sites all day long, there’s something that can’t be matched with a person to person connection. For this, they hang out at the game store. At the game store, you’re certain to meet that babe that just so happens to love the exact same game as you and you two can talk for hours about the how long it took you to beat level 79. Ooohh, stimulating. In the end, the stigma that says that gamers aren’t able to find love is utter nonsense. They might spend copious amounts of time online, but that doesn’t mean that love can’t be found and kept. If you’re a gamer looking for love, maybe you can start on an online dating site…but if you’re tired of virtual reality and want a relationship that is in the same dimension as you, try hanging out at a Comic-con. Love can be found…just after you beat this level.